My story starts back in 1999 when I went to the doctor for anxiety issues. My anxiety was situational – I had a very sick mother, had just started college and was in a not so great relationship. I guess since I was so young, short-term anti-anxiety medications were out of the question and I was given antidepressants. The problem with antidepressants is that if you are not clinically depressed (don’t have a chemical imbalance in your brain) then they can actually cause a chemical imbalance creating the very same issues they are meant to treat. I thought something was wrong, so I went to the person who was supposed to know- a psychiatrist. There, I was diagnosed with bipolar disorder. Let me reiterate here that I had no chemical imbalance to start with. So here begins my journey as a “crazy” person. I was pumped so full of medicines that I didn’t need until basically I had become a zombie – barely able to function in daily life – and that just kept them filling me with more meds. I never questioned the doctors because I trusted them. Also, since the medication was causing the same symptoms that I was “supposed” to exhibit, I believed that they were correct. Maybe I was symptomatic, but through it all (hospital stays, the loss of my mother, a physically abusive husband) I was never suicidal. I just had “issues” and dealt with them accordingly by taking the medicine that I was prescribed – exactly as it was prescribed. However by 2005 I was separated from my husband, was halfway homeless, and still wasn’t over the death of my mother. A “perfect storm” was brewing. Add to that the addition of a new medication to my regimen that caused suicidal thoughts and BAM! I purposely overdosed on said medication and spent the next 6 months of my life in the hospital. During that time I spent three an a half weeks in ICU. While in a medicated coma an NG tube was inserted for nutrition purposes and I was given a tracheotomy for life support. Apparently the NG tube was not inserted properly and my stomach was punctured, allowing the “liquid nutrition” to fill my abdomen for a week before it was discovered. I turned septic from infection, had double pneumonia, a lung collapsed, my kidneys and liver both failed and I developed MRSA. My family was advised to remove me from life support. However, since I was still legally married, the final decision rested with my ex and he refused to sign the papers to have me removed. I eventually began to get better. After the stomach perforation repair surgery, my abdomen was left wide open to allow the infection a way to get out. A wound vac was used. That is one feeling I will never forget and one that I pray I never have to experience again. I endured humiliating bed baths, respiratory therapists that would get angry with me when the tracheotomy tubes would loose suction and I felt as if I were suffocating, the inability to tell anyone anything because of the trach, and nurses who were so rude and disrespectful that my sister actually got one of them fired. After the six months in the hospital, I spent another month in a rehabilitation hospital learning how to walk again. A 24 yr old amongst a sea of grey-haired people with broken hips. After that was a few months of home health nurses who came out every week to check on the open wound left where my belly button had been. It was about 3 inches in diameter. Eventually, skin grew back over it. Let me add in here that as soon as I was discharged from the hospital I quit taking all of the medications related to my “mental illness”. Funny thing that for a disease with no cure, I was perfectly fine. Turns out that it had been a misdiagnosis to start with. It wasn’t until recently that I started exhibiting anxiety issues again and started going to a great psychologist and psychiatrist. I now take medication for my anxiety, not for a problem that I don’t have. My next surgery was in 2006 when a hernia developed where the open wound was. Since it was left completely open (the muscle wasn’t even closed back) the hernia was inevitable. That surgery was done by the same doctor who had done my gastric bypass in 2001 (I forgot to mention that, huh?). I think he was the only doctor I trusted at that point since I did extremely well with the bypass. After that, I continued to hurt in my stomach, but of course none of the doctors could find a reason for it. One doctor went as far as to say that there was absolutely no reason for my pain – it had to be in my head. He said that he could refer me to a psychiatrist or he could add me to the office’s list of drug-seekers. Needless to say I never went back there again. In 2007 my ob/gyn found a cyst. I was told that it was an ovarian cyst. He tried to remove it using laparoscopy but said that he was unable to because of scar tissue. That was the first time I had heard any mention of scar tissue. He claimed to have removed what he could of it before closing me back up. I had two other surgeries for “ovarian” cysts before finally being told that none of them had actually been attached to the ovary. They had all been free- floating cysts found amongst scar tissue. This was when it was explained to me that internal scar tissue is also known as adhesions – probably caused by the abdominal infection in 2005- and I apparently had a ton of them! During these last two surgeries, no adhesions were removed. I was told that it would have been too dangerous to even try. I was finally told by my fertility specialist (the one who had done the past two surgeries in order to try to preserve fertility because other doctors would have rather just done a complete hysterectomy to save time) that he could no longer be in charge of my care because I was outside his realm of expertise. He suggested an oncologist because he believed them to be some of the best laparoscopic surgeons and best capable of removing the adhesions. I saw a great oncologist who listened to my story and who had actually been present at my last surgery. He said that as much as he would like to be able to help me, his specialty was cancer, not adhesions, and that there had to be someone better qualified to be in charge of my care. He was the first one to put me on narcotic pain medicine. I had been avoiding it at all costs because I was in college at the time and needed the mind clarity to do well. However, my blood pressure had begun to rise as a result of the pain and I gave in and accepted the medication. Of course, it did what I was afraid it would do and clouded my thinking. After some research, I finally found my current doctor. He completely lived up to his online reviews. On the first visit, between the exam and time in his office, he spent anywhere from 45 minutes to an hour with me. He thoroughly went over all post operative records from the other doctors and quietly listened to my symptoms. I told him how I could no longer even sit through a two hour college class without having to stand up and walk around to relieve the pain and pressure and I also told him about the effect the pain relievers were having on me cognitively. He was the first doctor EVER to tell me “Of course you’re hurting! You have too much going on inside of you not to be. Your insides are completely stuck together with adhesions.” Do you have any idea how relieved I was to not hear once more that there was absolutely no reason for my pain or that I was some other doctor’s problem? I wasn’t crazy! I felt validated! He told me that he wanted to try to avoid another surgery, but that we would come up with a game plan to try to make life manageable. We did a pretty good job for about two years using medications, trigger point injections, and physical therapy. I did have to quit school, though, which broke my heart. Being very close to my last year, I was simply unable cognitively to handle the ever present research paper that seems to be a part of every upper level class. Having to leave school without finishing for the second time in my life almost broke my heart, but I just couldn’t do it anymore. My life since then has been pretty bleak. I spent a couple of years in bed. Mainly because of pain, but partly because I was depressed having realized that I had finally become completely useless as a member in society. I couldn’t keep my own house clean. Only on rare occasions was I able to cook a decent meal for myself and for my partner. He had to work all day and then cook his own meals too while I wasted away in the bed. I finally agreed to go to a pain clinic. Up until that point pain specialists scared me. I truly thought of them as legalized drug dealers and wanted no part of it (that’s what you get for watching too many documentaries on TV about the pain clinics in Florida). I finally agreed, however and was pleasantly surprised that his goal was also to get me off of the narcotic pain relievers by using different types of nerve blocks so that the affected sets of nerves were unable to transmit the pain signals to the brain. So far, we have been unable to find a set of nerves that work, and the insurance company as of late, has been denying requests to try more. After that, I saw a rheumatologist who diagnosed me with Fibromyalgia. So on top of the adhesions, the fatigue and muscle aches were because of the Fibro. Recently I was given an inhaled steroid that has greatly improved my energy and mobility. It may be a sign of an immune system disorder, but I will have to see the rheumatologist again to make sure. All I know is that after almost three years inbed it feels good to be moving again. Why is all of this in my “About Me” section? Because all of this has made me who I am today. I have been through a lot and I am strong. I am a good, loyal friend, and I have hope…hope that gets me through life, even if it is just a day at a time. This blog is my way of getting my thoughts out of my head, and my way of inspiring others. I want to teach people about adhesions so that they are no longer the medical profession’s tightly kept secret. I also write my blog here in order to meet people who are going through the same struggles I am, people who understand me. I persevere because of my online friends who support me when I need support. I fight…because I know no other way. I am so glad to have found this post. I know about pain and horrible it is when it cannot be controlled. I am so very glad you are getting relief for your pain and I will be praying that even more comfort will be coming your way. I am praying for you! GBY! I am so sorry that you know what REAL pain is like. Acute pain is so different to chronic and “normals” just don’t understand that. I appreciate your support and I will be praying for you as well. I think there’s a special place in heaven for people who suffer like we do…what do you think? I too, know what its like to have your belly left open from MRSA, I had it done twice, my insurance would only cover a wound vac once in a lifetime, so the second time I blew my hernia, and contracted mrsa again, they had to leave me open with wet to dry bandages, which of course took 3/4 more the time to heal than with the wound vac 😦 but I also had perforated bowel which led to a bowel resection which has led to another whole scope of issues, You poor girl………..I know exactly what you have gone through and STILL GOING today even though your belly is healed from the outside, you will never be right on the inside!!!!! I’m so sorry you had to go through that. If I have adhesions from it happening once you probably do to…now I’m completely jealous that you have been able to come off your pain meds! You’ve been through so very much. I can relate to nasty medical people. I have a severe phobia of doctors as a result. I have to be drugged to be able to go at all. I also had my bladder removed when I was 28. It was supposed to make things better, it didn’t. No doc has been able to find why. I’ve lived with it not being better for 15 years now. I’m so sorry to hear that, yes, I think we have a lot in common. I have dealt with emotional/mental abuse now for a while and I am just trying to get away from it. I’m scared how long it will take me to get back to normal again. I’m a shell of the person I used to be. Nice to meet you too. Yes, I will take a look at your blog. Thank you for commenting to let me know you were here. I wish that our shared experience of adhesions isn’t what initiated this connection, but it brings me comfort to know i am not alone! I have a myriad of chronic health/pain conditions, but my abdominal adhesions can be some of the worst and there just aren’t many treatment options for them! When I was 33, my colon perforated (reasons unknown) and I was septic for almost 2 weeks (!) before any doc would listen to me. Fast forward 7.5 years, and 8 abdominal surgeries later (colostomies, iliostomies, hernias, abscesses, etc!) and my insides are also stuck together. I, too, had a wound vac (twice) and woke on a ventilator (few know of this horrific/stifling feeling!) and still am not sure where my once cute belly button has gone (sigh!). They have done surgery for “lysis of adhesions” but they just grow back. Sometimes it feels (and actually looks) like an alien is in my belly as my stomach tries to digest food (they say it’s like a snake eating a frog, my adhesions cause bands around my stomach where the food cannnot pass, and it creates a balloon of pain). Few doctors truly listen to this- I think they feel powerless over how to treat it and docs don’t like to feel powerless!!. I use a lot of guided imagery to help with my pain. And I’ve had to totally reinvent my life. But shared blogs like this help me (thanks for listening! ); just knowing we’re not alone (or crazy). It’s so much about acceptance; I don’t have to like what has happened to me, but if I acknowledge it, I can then choose my attitude towards it. Something has kept me alive this long and I refuse to “give in” to the pain. But some days (many days) it can be hard, oh, so hard… so I will just repeat “this too shall pass” over and over like a mantra. You are strong. You are resilient. You are a beacon of hope for others. You have a purpose; to share your story and help others through theirs. I feel blessed to have “found” you and during my morning meditations, I will picture you bathed in the white light of healing and love. Thank you so much for sharing your story with me. We have gone through a lot of the same things, but it sounds like yours has been a bit worse. Even so, you seem to be managing well…much better in fact, than me. I still rely heavily on medications while trying different nerve blocks. So far only one has been somewhat successful. The second and third time, however, no luck. I too have misplaced my belly button somewhere. Long gone are the days of belly button rings (sighs). I am glad that we have found each other as well. The friendships I have made here have been so very rewarding and I believe they are what got me through this year. Thank you so much for the visualization for me. I have tried guided meditation but so far have been unsuccessful at mastering it. I hope you continue to comment and I will definitely be keeping up with your blog as well. Tonight I will toast to all my new friendships and you are now one of them. Namaste. Thank you for these blessings! Oh my! It sounds like you’ve had a hell of a time. I’m really sorry that you had to go through doctors telling you that you were crazy – I’ve had that happen and I know how it feels. I’m glad that you know what’s going on with you now. Yeah, it took a while. I guess it’s my own fault, what I went through, for trusting the doctors all those years ago. Now I don’t take anything or agree to any procedure without researching it first. It truly saves a lot of heartache and pain. I’m still in that mentality that “you’re the professional, so I leave it I your hands” but after all the trouble and such, I’m starting to really only trust certain doctors who tell me how it is and that I have a meaningful relationship with – my therapist being one of them. She’s actually taken over my pain management while working with my depression and anxiety. This woman is a dream. Thank you Judy. You always say the sweetest things. You know I felt so alone for so long that I felt like if I could touch one person – let they know they aren’t alone – then that was what I was going to do. 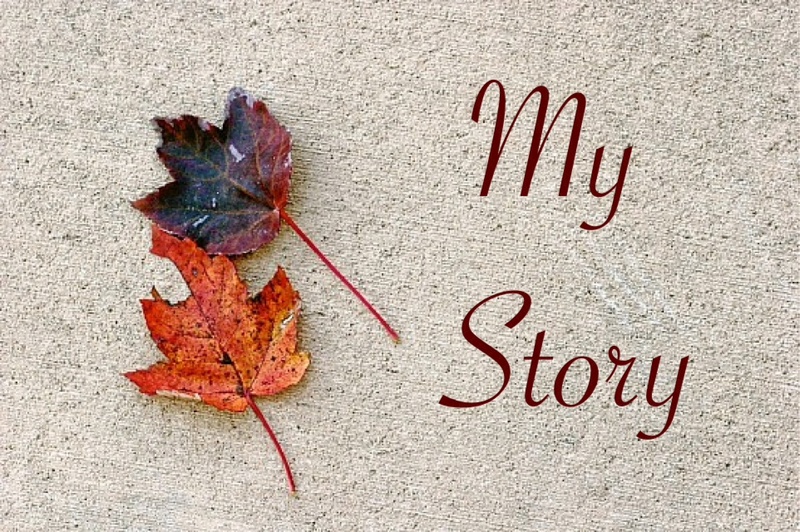 I figured I would tell my story because that’s all I have anymore. The me I once was is gone, and now I’m just getting by day to day, page after page in the story of my life. I also believe that we were chosen for this. I don’t know why, but we were. Lol…no can’t forget that one. Thank you for sharing. I’ve found that if I put all those feelings and emotions out there (into cyber-land) I not only feel a bit of relief from getting it out, but also usually get really good feedback from others. I totally understand why you would want to hide it. I believe that most of us tend to want to hide it because in a way we feel guilty for not being able to “get over it” like people tend to want us to do. However, I feel that we need to speak out and raise awareness for our own and other’s invisible illnesses. The stigma we receive comes from people who truly don’t understand. They need education. That’s why they say the harsh things they do. Congratulations for speaking out. The first time is the hardest. I never post about it in my blog well, I started my blog because of a knee replacement but that’s an isolated thing. It morphed into a photography blog. I think I enjoy the photos because it makes me feel happy otherwise I sink into depression. I’m glad I found you. Have a great weekend! You do the same. Actually I was just looking at your blog and the photos are AMAZING! It’s true though…if you find something that makes you happy, hold on to it. And, just my opinion, you have some serious talent! Keep doing what you’re doing! Oh my you poor girl !!! my tummy churns to read your story. Hats off to you Joy, for showing us what being positive and hopeful is all about. My teen daughter went through a debilitating mystery sickness and was hospitalised last year, missed her school, exams and grades. It took a long time for us to stand up again !! yes, the only thing that kept us going was one word ‘hope’. We even came close to losing faith in God !!! Been there, done that. As a matter of fact, that’s about where I was when I started this blog. Soon after starting to write, I had my last surgery that my doctor and I argued 3 yrs about doing and when I woke up and he told me that the adhesions were too bad for him to do anything but take some pictures I went through a deep depression. I cried, I screamed, and I repeatedly asked God why. I finally realized that it’s not for me to know why. He has a plan and if this is it, then that’s how it’s supposed to be. The only peace I could find was in writing about my story, hoping to be able to help other people…to be there for them when no one was there for me. Surprisingly, I have found some of the most supportive people I have ever met. Now I have that support system I needed and hopefully I have been equally supportive of others. On another note, I just wanted to tell you I looked at your blog and I was AMAZED with the crochet work you do. I began crocheting a couple of months ago, so I’m still learning. I can make scarfs, fingerless gloves, beanies (just recently) soap savers, and I am in the process of working on a lap blanket (it bores me after a while). I’m now working on trying to read a pattern…I still have trouble with that, but I want to be able to do more things. But to see how you made those birds WITH NO PATTERN…I’m just in awe. You truly have a gift and I am looking forward to seeing what else you come up with. You are very welcome … very well deserved!! Hugs …..
I’m looking for someone to guest blog on my website about fibro and adhesion and guess who came in mind ? 😉 Do you wanna do it ? I have no deadline so you can take your time. You can email me at greengrowsdark@gmail.com kisses! I would love to do a guest blog for you. However, Fibro and adhesions are really different and I haven’t been formally diagnosed with Fibro yet. I will see the rheumatologist this month to see if I really have it. So, how about we start out with one about adhesions, and then if I get the Fibro diagnosis I’ll talk about how it affects me, or I’ll give you someone else’s name who might would do one on Fibro? Post sent. Hope you like it!